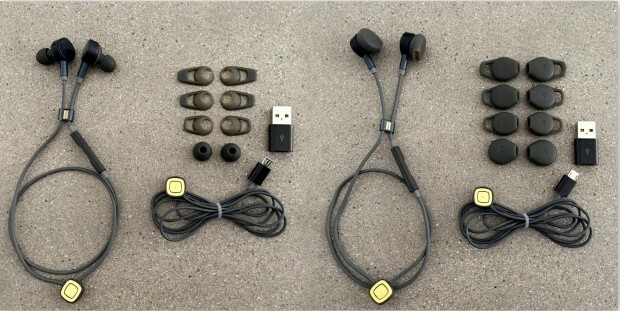 Earphones That Charge Through Your Phone! PUGZ are the world's first wireless earphones that lets you charge them through your phone. Plus you can listen and charge at the same time. The key differentiator in PUGZ earphones UX is their patented self guiding magnetic connector called "The Squircle". The metal parts are made from 18K gold. You can charge your PUGZ earphones on devices such as computer (USB), AC-adapter (USB), Android (micro-USB). If the battery is low, just 'Squircle' your Pugz and keep on listening. With no wires attached to your phone you can easily access your PUGZ and enjoy a smooth wireless experience. The lightweight and minimal shape of the earphone creates the perfect fit and lets you walk around tangle free. PUGZ is compatible with all your devices with Bluetooth such as mobile phone, computer, tablet, TV, Apple Watch, etc; and will be available in 4 different colors: White, Red, Pink and Black. PUGZ will be available in two styles, Sealed and Leaking. Sealed provides you with a passive noise cancellation which isolates all surrounding noise and lets you focus on your music experience; while Leaking directs the audio into your ear but lets you hear a bit of your surroundings.